Closed-tank aeration is a well established method for preparing iron, hydrogen sulfide, and manganese in well water for removal by a filter. Standard closed-tank aeration systems consist of a method for introducing air into the water and a closed aeration tank where the actual treatment (oxidation) of the contaminant takes place. The treatment tank is then followed by an appropriate filter to actually strain out the oxidized particles. The earliest closed air systems relied on a small venturi installed in the water pipe to draw air into the water stream. Venturi injects air into water stream. The air-rich water was then sent to a small treatment tank where oxidation of the contaminant took place, turning “clear water” (ferrous) iron to “red water” (ferric) iron which is easily caught by a filter in a separate tank. The process works the same for manganese and hydrogen sulfide, which, like iron, are “oxidized” to more basic substances with a physical form that can be trapped by a filter. 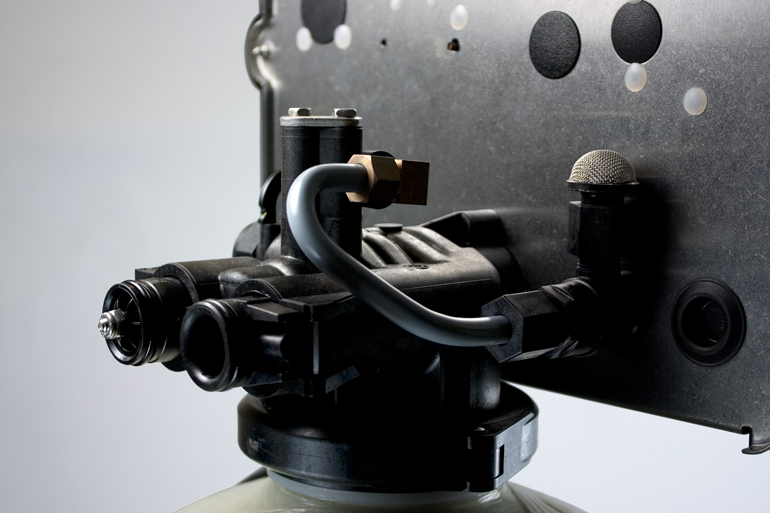 More aggressive compressor-driven aeration systems use a small air pump to pack compressed air into a closed treatment tank. The compressed then forms a pocket in the top third of the tank. As water enters the tank, it falls through the pocket of compressed air and oxidation of contaminants takes place. These systems are very effective and can be used to treat large amounts of both iron and hydrogen sulfide. Both systems described above require a separate treatment tank where oxidation of the contaminant takes place followed by a filter tank where the contaminant is removed. Both can be very effective, but they have drawbacks. The venturi system restricts water flow considerably, so it is best used only on small residential systems. The air pump system is very effective but it is also fairly elaborate to set up. It requires electricity to power the pump, and in most systems, to control the venting system that provides air turnover in the treatment tank. 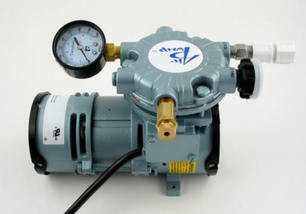 The small air pump is usually used to inject air directly into the aeration tank. A more recently developed treatment style performs both functions, aeration and filtration, in a single tank. Single tank systems use the filter tank itself to perform aeration and the filter’s control valve to draw in air for the process. In the more passive, single tank system no air pump is used. Air is drawn into the treatment tank with a venturi system similar to the one used by water softeners to draw in brine. Air is taken in only during the nightly regeneration phase. 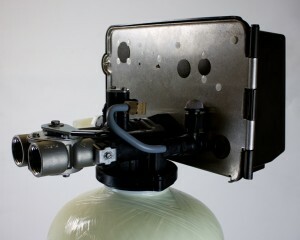 During regeneration, air is pulled into the tank and all water is expelled. 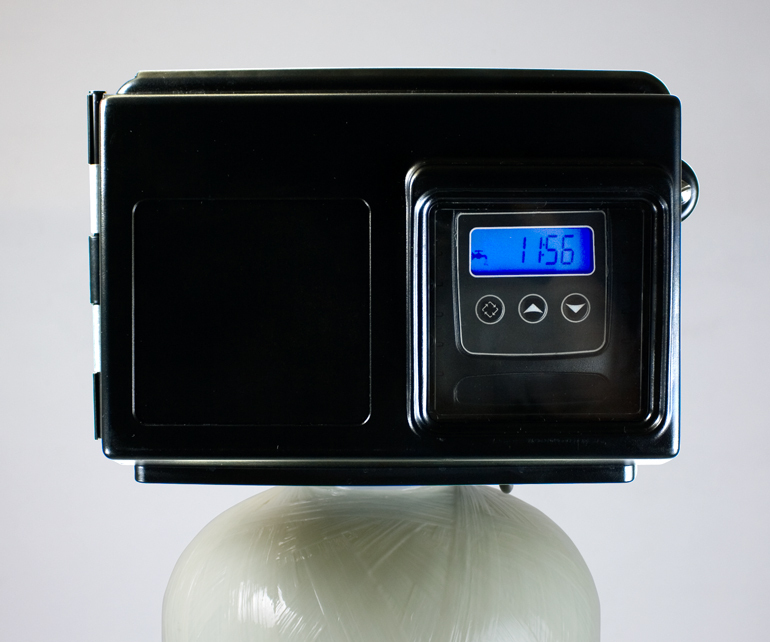 When the tank refills, the air is compressed into a tight pocket that sits above the filter media. As water to be treated enters the tank, it sprays down through the air pocket where the contaminant is oxidized and prepared for removal by the filter media in the bottom 2/3 of the tank. Actually, the entire tank becomes an oxygen rich atmosphere favorable to optimal performance by the filter media. A great advantage of single-tank aeration systems is that they can be used with a wide range of treatment media and strategies. Almost all the standard iron/manganese/sulfide media work well when aerated. Birm, standard filter carbon, and catalytic carbon have long been used with aeration. When coupled with aeration, Filox, the premier iron remover, is a star performer. Filter Ag and other granular turbidity reducers like ChemSorb and Micro Z become excellent iron filtration media when housed in an oxygen-rich treatment tank. Calcite can play the double role of pH neutralizer and iron remover when used in a single-tank aerator. Here are some examples of very effective single-tank applications. The life of carbon treating sulfide is greatly increased with aeration. Works well with high levels of hydrogen sulfide and moderate quantities of iron. Aeration greatly extends the life of catalytic carbon. Not effective with hydrogen sulfide.Birm is a favorite in single-tank aerators because it works so well when the oxygen content of water is high. It is also relatively light and easy to backwash. Filox filters should be sized smaller than Birm filters because of high backwash requirement. A 9”X 48” Filox filter, however, supports a higher service flow rate than a 10” X 54” Birm filter. Filter Ag can also be mixed with Birm. Light and easy to backwash. As the pH of oxygen rich water goes up, granular calcite becomes an excellent iron filter. 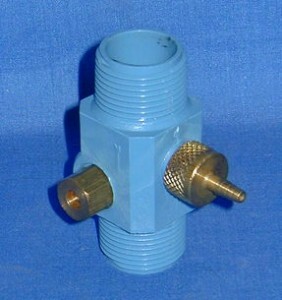 This filter can be used as a stand-alone, or with high levels of iron, it can be followed by an additional iron filter. Although this is a bit of an oversimplification, manganese is removed by the same methods that are used to remove iron. Manganese is more difficult to remove, however, and the pH of the water must be higher than that required for iron removal. Most iron media work well when the pH is at or slightly below 7.0, but manganese removal may require a pH as high as 8.5. The 10″ X 54″ single tank aerator from Pure Water Products can be used with a variety of media to treat iron, hydrogen sulfide, or manganese. The almond tank allows viewing of the air pocket when a flashlight is shined on the tank wall. The easy-to-program electronic control allows the user to select duration of backwash, rinse, and air draw as well as regeneration frequency. Air is drawn into the unit through the dome-shaped screen and a check valve maintains the air pocket by preventing air from migrating backward through the inlet. The unit comes with a stainless steel bypass valve for easy installation. See How Does Aeration Work? and How Aeration Systems for Water Treatment Work.